Now under the guidance of the Mondavi Family, the Charles Krug Winery honors its roots while forging ahead to the future. From the Wild West to the twenty-first century, relatively crude beginnings gave way to the finest form of winemaking. Founded in 1861 by Charles Krug, the 27-year old Prussian immigrant came to America with little besides willpower and a willingness to work hard to build the cornerstone of the first winery in the Napa Valley. He became the major local winery figure of his era, greatly influencing Napa Valley's development as a world-renown wine producing region. His leadership was said to be inspirational and his ideas innovative. Charles Krug introduced the cider press for winemaking, the first of which is still on display at the winery. He carefully selected rootstocks, varietals and vineyard sites - a novel concept in late 19th century America. After his death in 1892, James Moffitt held the winery in proprietorship through Prohibition. By 1943, he found a pioneering spirit in Cesare Mondavi, an Italian immigrant with a passion for wine, and sold the winery to his family for $75,000. At 60 years old, Cesare Mondavi spearheaded a dramatic renaissance in the decade that followed. 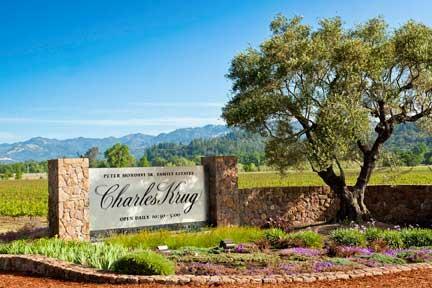 Wine historian Charles Sullivan writes in his book, Napa Wine, "By the early 1950s it was irrefutable that the Valley's Big Four had been augmented by one - the Charles Krug Winery". Cesare died in 1959 leaving Rosa as President with sons Robert as General Manager and Peter as Vice President. In 1966, Robert moved south to Oakville and began construction of his own winery. Upon Rosa's death in 1976, Peter became President of the winery. Peter's industry innovations from his studies at Stanford and Berkeley included revolutionary research on cold fermentation, enabling the production of exceptionally crisp, fruity white wines. His pioneering efforts to plant vineyards in the Carneros region with chardonnay and pinot noir grapes, cold sterile filtration techniques and aging wine in small French oak barrels contributed to his being named one of the twelve "Living Legends" in 1999 by the Napa Valley Vintners Association. Above all else, Charles Krug Winery is a family winery. Peter's sons, Marc and Peter Jr., continue their dedication to producing the finest Bordeaux style wines in the Napa Valley. To achieve this, they initiated a nine-year, $22 million investment program completed in 2010. Over 400 of the winery's 850 prime acres in Napa Valley have been re-planted and state-of-the-art winemaking equipment is now in use. Wine Enthusiast 90" This wine was half barrel-fermented, with just 25% of it new and French oak. It benefits from this treatment, offering fruit that leans toward Meyer lemon, melon and a vaguely tropical vibe, remaining balanced throughout, but especially on the finish. "